June is a month celebrated around the globe to rejoice and reflect on LGBTQ history. This weekend is DC Pride, and DC has a long history of celebrating this weekend in high style. The Capital Pride Alliance works hard year round with a coalition of area groups and volunteers to pull together an incredible celebration of LGBTQ diversity. 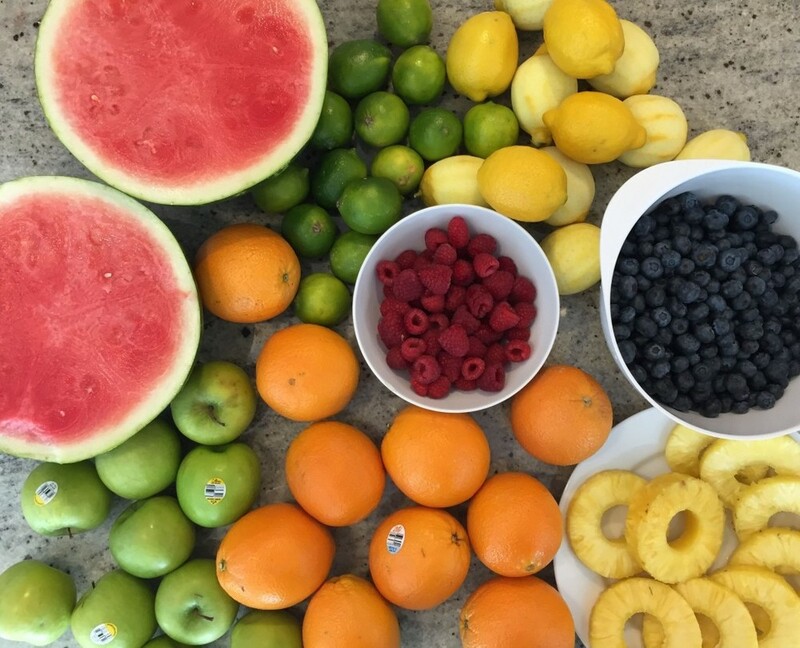 Here are some of our highlights, tips and a recipe for "Edible DC Rainbow Punch" that is sure to quench your thirst during this weekend heatwave. BYT (Brightest Young Things) is known for throwing epic parties and they are back again with the Capital Pride Kick-Off Party @ Arena Stage. The flashback theme is great for bringing out old workout clothes, neon colors and your treasured spandex. Before: Swing by 17th street the original DC gayborhood and visit a number of businesses that are LGBTQ owned, run or supporters. It's easy to spot them as they have rainbow flags and decorations. Our picks would be Duke's Grocery for food or JR's Bar & Grill for drinks. After: Don't have tickets? Go to Nellie's or Town located on U St. NW and merge with the after-party. They will have shuttles from the Arena Stage party directly to U St. all evening. Saturday is the famous DC Pride Parade which starts at 4:30 PM at 22nd and P St NW and runs until 7:30 PM. The path goes through Dupont Circle, the historic 17th Street neighborhood, cuts through Logan Circle neighborhood, takes a left on 14th St and ends at S St. Remember to stay hydrated! It's going to be hot. Pick a strategic spot along the route and prepare to be bombarded like a Baz Lurhmann film with beads, sequins, drag queens, families and over the top floats. Before: Host your own gathering celebration or go to brunch, one of DC's favorite meals out. Some of our picks for brunch would include Annie's Paramount Steakhouse on 17th St. NW or Birch & Barley 14th St NW. Then head down to Pennsylvania Ave. NW between 3rd and 7th St. and enjoy food, drink, and loads of entertainment. After: Take a disco nap and hydrate up. After you awake from your slumber, head to any LGBTQ establishment across the city. Our pick would be Number Nine on P St in Logan Circle. They have a super classy split level bar with a great crowd, tunes and drink specials. Before: Grab cold press coffee at one of our amazing local coffee spots such as La Colombe Coffee, Compass Coffee, Chinatown Coffee, The Coffee Bar, The Wydown, Bake House or Whole Foods P Street. If you want to brunch, might we suggest the creative cuisine at Compass Rose on 14th St.? After: We would suggest one of the hottest outdoor spots in DC, the gay-owned DACHA beer garden located in Shaw. They have massive umbrellas to cast some shade, and excellent beer selection. Sunday happens to be the gay gathering place. Adapted from Bon Appetit recipe for Algonquin Bar Punch. Making anything rainbow can be a bit of a pain, let's be honest, since it tends to involve a lot of produce and a lot of slicing and dicing. But the rewards are so worthwhile from the oohs and aaahs of your party guests from the beauty and the delicious factor that hits them from their first sip. Our fruit-inspired punch screams "It's summer!" and lets your rainbow be the party standout. Start by muddling the lemon peels and sugar with a wooden spoon. Next, add the raspberries and mash away until you have a nice pulp mixture and the sugar has dissolved. Pour in sloe gin, your gin of choice, lemon juice, and dark rum. Stir. Add ice and put in the fridge to chill. When ready pour the punch mixture into the drink dispenser, add champagne and you are good to go! Enjoy your Pride cocktail creation with friends and family. (Expert note: if you have enough time make an ice block the night before place in center of drink dispenser fruit layer for core chilling. Otherwise just have an ice bucket next to the dispenser for guests). To learn more about the Capital Pride Alliance and all the events taking place this weekend and throughout June visit here.